We climbed into the “mini-bus, ” 15 people inside plus luggage, which, when you do math, comes out to about 7.8 people per seat. I stood, hunched over the entire way, praying that our driver would at least manage to avoid one or two of Syria’s famed potholes, which have been known to swallow full grown elephants. The harrowing, deeply uncomfortable, ten minute ride to the Damascus bus station complete, and miraculously still breathing, we purchased tickets for the four hour ride to Palmyra, where ruins of an ancient Roman city are still being excavated. We drive through the desert. Sandy, dusty, and when the wind kicks up here, watch out, as the ensuing sand storms have buried many an unlucky traveler alive, that is assuming they survived the onslaught of sand shrapnel being propelled at speeds faster than light. Perhaps even more chilling was the sight of "Baghdad" on a road sign, and the knowledge of just how close we were to the Iraqi border, to the chaos my own country helped spawn. green sign- Baghdad straight ahead!! Hooray! 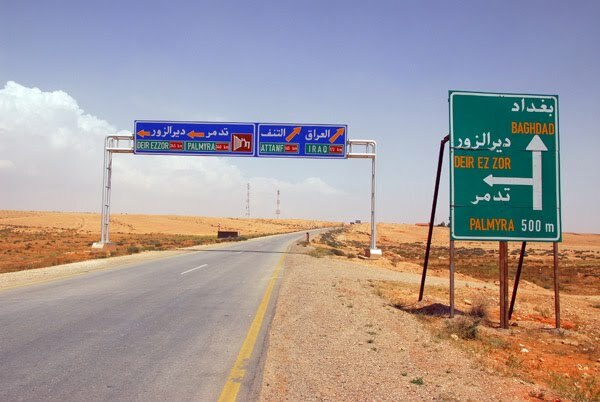 Palmyra’s bus station is actually a couple miles outside the city limits. Imagine travelling from some distant galaxy through the vast nothingness of space to visit earth, and being dropped off on the moon. We were lucky there was a space shuttle to take us the rest of the way. a date palm with more dates than you could ever eat! A half mile outside the town’s opposite border, lies a Bedouin campground. Honestly, we could not have made a better choice of a place to stay. Drawing from a nearby, and rapidly disappearing, reservoir, drip irrigation has allowed the blossoming of a garden, a green island in this sea of sand. With the owners keeping in lock-step with rightfully famous Arab hospitality standards, a massive ancient Roman wall sheltering us from the wind, pomegranate, date palm, and olives trees providing us fresh fruit and shade from the desert sun, a Bedouin tent to keep us warm at night, and of all things, a swimming pool to help stave off heat stroke, this place was as magical as Syria gets. A giant castle built in the late 1600’s sits atop a mountain. Perish the thought of ever conquering the citadel, it’s hard enough to make the treacherous walk up the steep hill. To gain access inside, you’d have to overcome a twenty-foot wide waterless moat with a hundred feet drop in case you didn't make the jump. Enemy soldiers should just announce their intention to chill out and watch the sunset to avoid being fired upon; at least it worked for us. From atop the mountain, a panoramic view-- the oasis area, clashing with the harsh and barren desert which surrounds it on all sides, only a few precious drops of water keeping the army of green from being swallowed whole; the nearby town of Palmyra, and the red sun disappearing behind the Western hills. We stayed there a good forty minutes after sunset admiring the vista, and the peaceful, uncomplicated nature of the countryside. Entering into the tranquility of the meditative moment, I begin to wonder whether I am dreaming. Why we so often think every little challenge to be such a monstrous, life-threatening problem. Nothing seems real here, nothing seems important. Call it growth, that’s the way I like it.